Newly built secluded two bedroom villa. One double and one twin bedroom, both with en-suite bathrooms. Large semi-circular outdoor pool and heated pool in the master bedroom. Good mountain views. Located in the village of Islamlar, this secluded villa has two bedrooms, one double and one twin, both with en-suite bathrooms, and a capacity for four guests. The accommodation is on one floor and consists of a spacious open plan kitchen/dining and lounge area, with a bedroom on either side. There is an additional w.c. to the living area. The property is air-conditioned throughout, has a wi-fi internet connection and a large private garden. The villa has a distinctive semi-circular pool with a Bali style seating area in its centre, an idyllic location for guests to relax during the day or dine in the balmy evenings. This is an ideal property for those guests that enjoy swimming as the distance between two ends of the 10 metre diameter pool is approximately 15 metres in length. In addition to this stunning pool there is also a good sized, (4 x 2.5 metres ), indoor pool located within the master bedroom. This indoor pool is heated over the spring and autumn months at no extra charge to our guests. The location and landscaping results in a high level of privacy of the villa, meaning that is is suitable for guests with high privacy requirements, be it for religious or other reasons. Situated on a steep slope near the entrance of the valley, the villa has magnificent views over the valley and partial sea views. The steep approach road to the villa leads directly to the private parking space adjacent to the entrance. 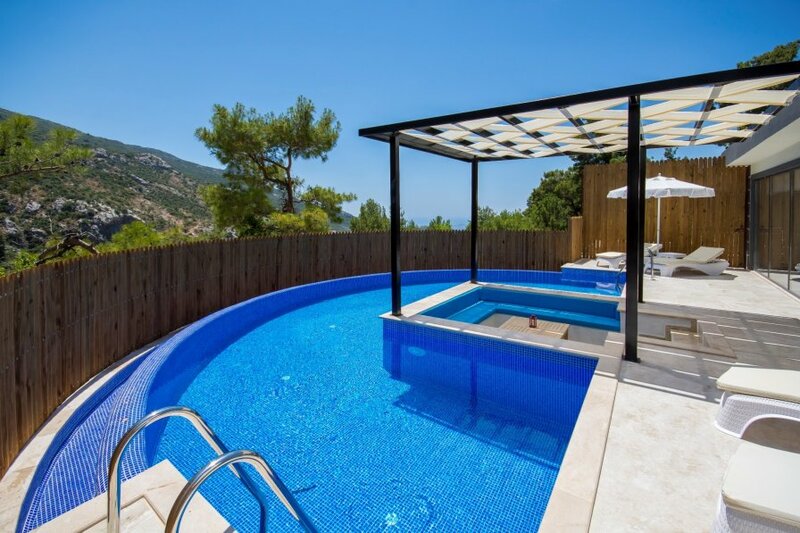 The Villas location is approximately seven kilometres from the sophisticated resort town of Kalkan,(about 10-12 mins. drive), and 1.5 km from the centre of the village, where guests can purchase their daily essentials.